Vitalograph In2itive™ combines the benefits of full spirometry, data integration and mobility in a small lightweight handheld spirometer. Robust Fleisch flow measuring technology and a simple icon driven menu, plus a large, high-resolution color touch screen and storage capacity for 10,000 subjects, makes In2itive the ideal solution for high quality spirometry on the move. Manual entry of subject data is optional as In2itive makes it possible to select all subject data from Spirotrac and download it automatically - saving time and eliminating data entry errors. Spirotrac® Software combines the power of your PC, network and spirometer. 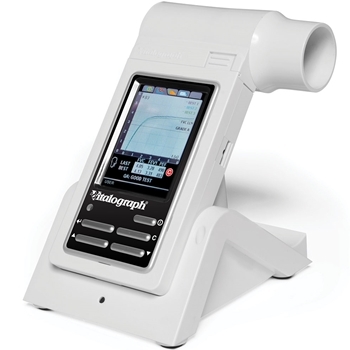 Spirotrac is compatible with a range of Vitalograph spirometers, each designed to meet your particular spirometry needs.